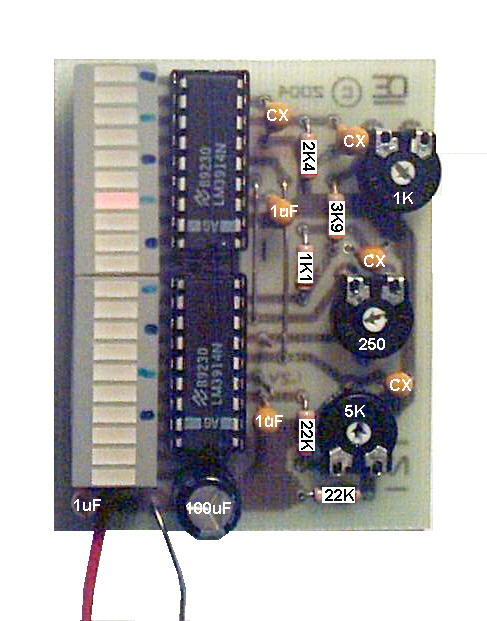 This is an Expanded Scale Voltmeter based on the National LM3914 chip. It is a 0.25 volt range between each LED. to corrected a few minor hum problems that affected some adjustments. This Voltmeter it set for a range of: "10.25 to 15 volts". The 20K resistor across the LED is required to null out the #10 LED. Leaving this resistor off will cause #10 to light Faintly when LED's above #10 are lit. This resistor is soldered to the copper side, due to space limitations! specified above. But it can be changed for Other Voltages and/or Ranges. 1) Set your supply Voltage to 12.500 Volts. LM3914. 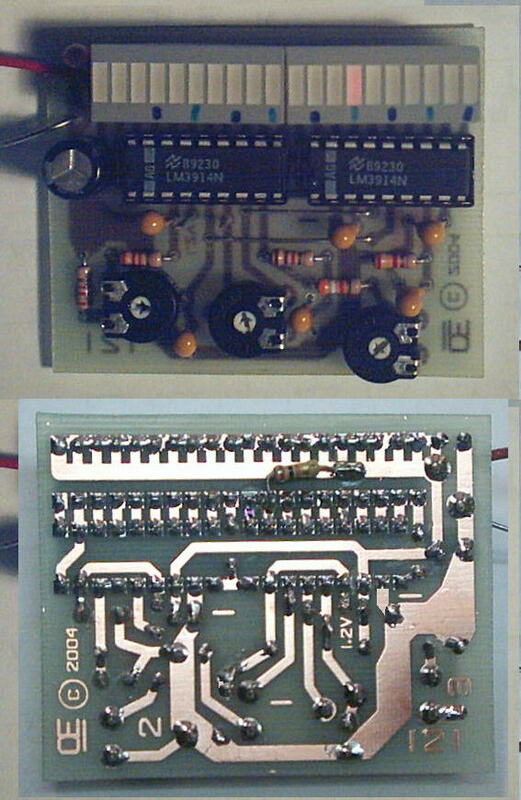 Test Point are provided on the board. This Must be set VERY ACCURATELY. 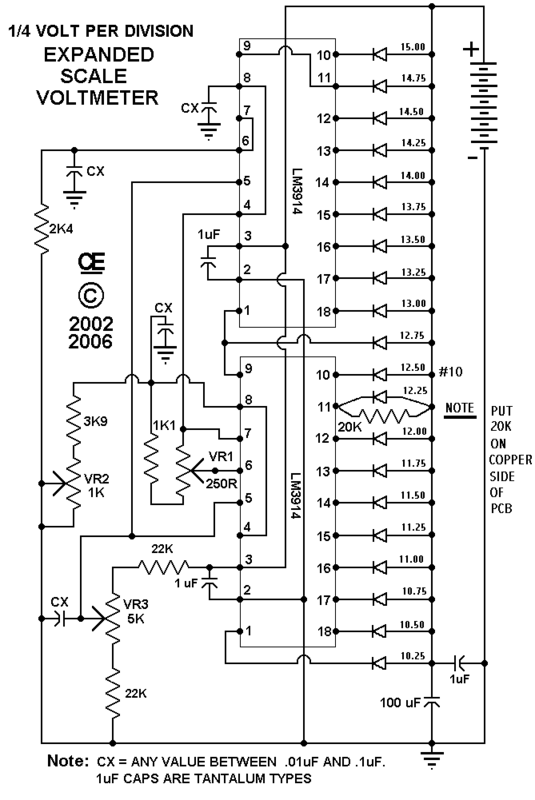 This is the LED marked #10 on the Schematic. The Full Scale should now be calibrated from 10.25 to 15 volts! Calibration Voltage Settings must be Very Precise with a good Digital meter.. This is for the Adjustable Voltage, Expanded Meter PCB. And we want a 1 Volt Division between Each LED. Number 10 LED will be 20 Volts. So set The Varying Input Supply for Precisely 20 Volts. 5) Lastly reset the input down below 11 volts and slowly increase it. a) The Lowest LED should now light up at 11 Volts. b) LED 10 Should light up at 20 Volts. c) And the Top LED should ligt up at 30 Volts. IF So, All is Correct. pin 9 to the supply rail will give a "Bar Display". "But as the bar length increases, SO DOES THE CURRENT, CONSIDERABLY". I can supply the LED displays, listed in my parts area. Look at "LED's, Bar Displays"
They are $1.50 each plus postage. All the other parts are available also. Postage cost on these parts depends on weight and where you live. 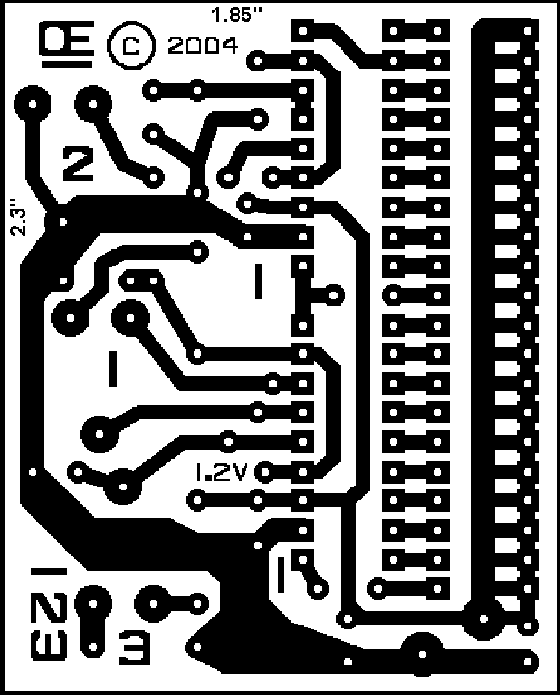 I can also supply the PCB for a Reasonable Price. NOTE: On Tantalum Caps, The Black line is Usually Positive. A New and Better Image.